If your obsessed about makeup like me, you will agree that the brushes are just as important as the makeup. I have only really recently grown my makeup brush collection to an amount I am happy with. 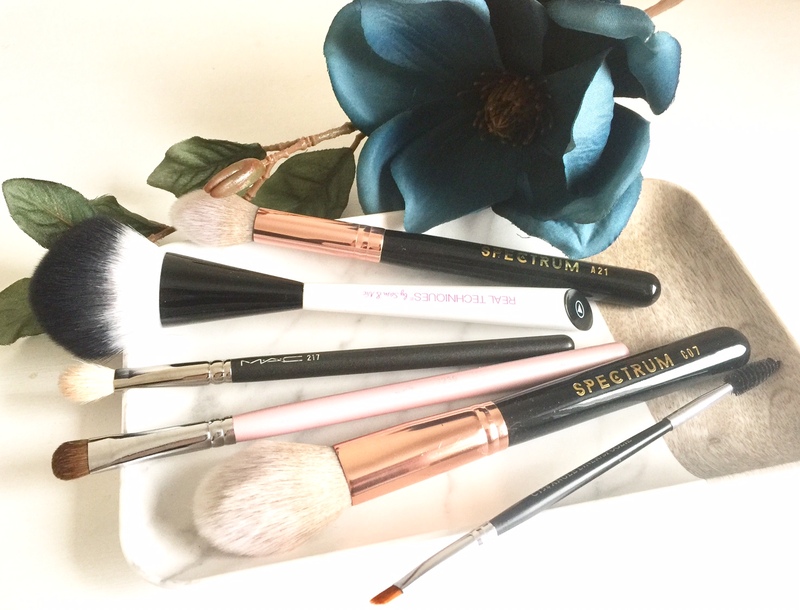 In this post I am going to talk about just a few of the brushes I own; the ones which have made a good impression and the ones I would recommend. How I used some of the brushes I used to own, I have no idea. I would say I definitely have more face brushes then eye brushes, which was actually a shock to me because I keep telling myself no more eye brushes as I didn’t think I needed them. But now….I need to make them even quantities so will have to get some more haha! The majority of my collection are Spectrum Brushes, and can I just say…WOW! I am in love, not only do they look amazing, but they also work amazingly. They have quickly become some of my favourite makeup brushes I own. I got them on a really good deal when I went to the Professional Beauty Show in London, which you can see here. The main things I love about these brushes are that they are so soft, in great designs, and apply makeup beautifully. I have the Siren Smoke Set which has seven eye brushes, and is the perfect set to create any type of eye looks. Along with these I have the Black Marbleous 12 Piece Set, which has 9 of their most popular face brushes and 3 smaller brushes for details to the eyes and lips. Now I will admit it, what first attracted me to the brushes was the way they looked. But I promise you they don’t only look good, as they are some of the best brushes I own. My favourite brush from them of what I own is the C07 sculptor, which is perfect for applying powder products. I use it for applying my bronzer and subtle contouring. Another favourite would be the A21 which is like a smaller version of the C07. This one I use for highlighting on the cheekbones and the bridge of the nose. Overall I can’t rate these brushes enough, I love them and can’t wait to add some more to my collection. The newest additions to my collection are the Real Techniques Multi Tech Collection. I have the large point brush which I love to use for blusher and contouring; or I use it clean to blend out what I have already applied. Then I have the XL point brush which I use to apply my translucent powder to set my makeup. I also picked up the XXL point brush which is like a large kabuki. This brush is good for blending out face products, and for adding a warm shaded powder around the edges of your face to give a warm glow. I did pick up the 360 point makeup sponge as well and have enjoyed using it, but for me personally the original orange real techniques sponge is still my firm favourite. I tend to use different brushes for the same things, and don’t limit one brush to one use. But the ones I have listed above are what I would call my current favourites, and would be the ones I go to first over the rest. Another brand of brushes I own are Nanshy and these have really soft bristles and blend products like a dream. I haven’t been using them as much as I used to just because I am loving using my newer ones. But I am planning to try and do a swap around just to make sure they all get used instead of just a certain few. Hope you have enjoyed listening to me ramble on about makeup brushes. What favourite makeup brushes do you have? Any recommendations? Next Post Treating My Skin! The Spectrum brushes look beautiful! I am looking to get new brushes and I am so tempted to try a few you've spoken about in this post! I can't wait to read more from you. Yeah spectrum brushes are amazing!! Im desperate to get all the marble ones along with the marble case lol! Marble addict btw ?